(RF/FWL) (Miami) 1996 - 2017. Photos. Framable Color Prints and Posters. Digital Sharp Images. Aviation Gifts. Slide Shows. Florida West International Airways (2nd) Boeing 767-316F ER N316LA (msn 30842) MIA (Bruce Drum). Image: 100157. 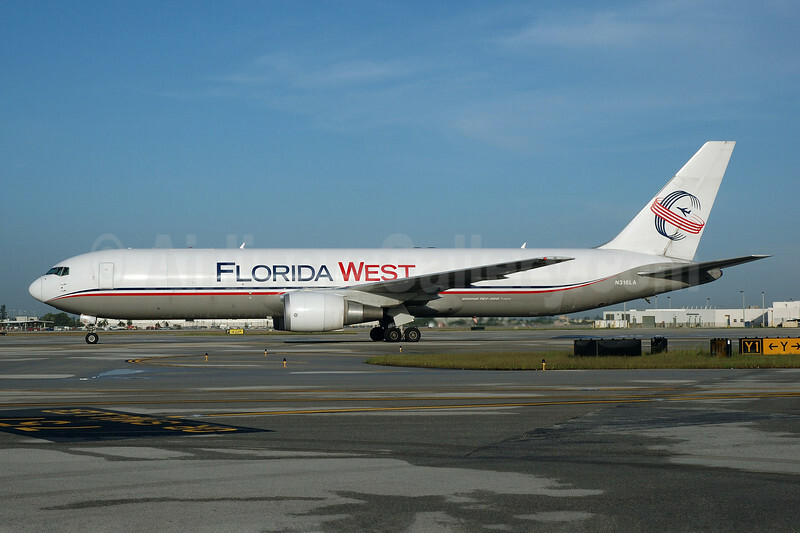 The original Florida West Airlines (1st) (Miami) was established in 1981 with Boeing 707 freighters. However the original company filed for Chapter 11 bankruptcy protection in October 1994. Following negotiations, its assets were sold to a new group of investors using the name of Florida West International Airways (2nd) (Miami) in August 1995. Operations under the new name started on March 12, 1996 with McDonnell Douglas DC-8-61F and later DC-8-71F freighters. In December 2000, LAN Airlines acquired a 25% stake in the company and offered to upgrade the fleet. The first state-of-the-art Boeing 767-316F (the pictured N316LA, msn 30842) was acquired on November 28, 2001 to replace the DC-8s. N316LA taxies to its cargo unloading spot at Miami.